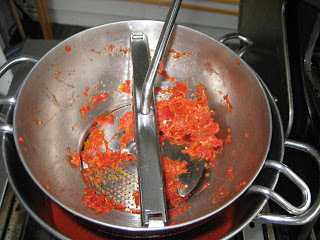 I have to admit that until two weeks ago I have never made or tasted pure tomato sauce. 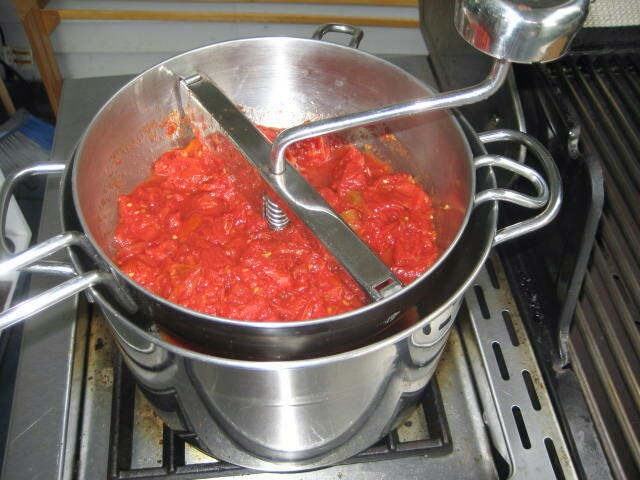 I have made hundreds of tomato sauces but they always had at least celery, peppers, onions and garlic in them. This was my very first time that I have made tomato sauce from my very own tomatoes with absolutely nothing else: no salt, sugar, onions, peppers, garlic or any other vegetables. Just tomatoes, slowly simmered for 4 hours (in this case) and then run through the food mill with the finest plate (1/16” holes). What a revelation it was! 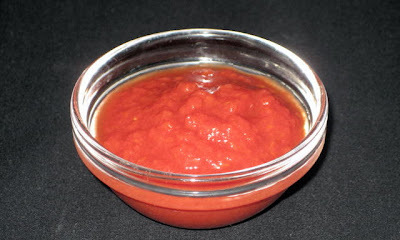 Mind you, I did make tons of sauces before using store bought tomatoes plus other veggies but since I have never grown paste tomatoes like Roma I had no opportunity to make basic sauce of my own. Now, I am hooked. Right after I have tasted the sauce I started Googling for San Marzano Lungo tomato seeds that have the reputation as the best paste tomato. Yup, I bought some and now my plans for veggie garden is going through some changes, at least in my mind, that is. My plan for next year was for only 3 tomato plants: one of each “Sweet Baby Girl” (cherry), “Magic Mountain (size and shape of large strawberry) and “Margherita” (Roma). Since San Marzano is meatier and dryer than Margherita I have decided to go with 4 Marzano instead and the salad tomatoes stay the same, 1 of each. There is not recipe here as far as I can see. Cut tomatoes in half and then half again, put in pot, cover, and start the simmer. 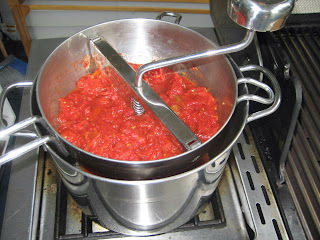 Stir tomatoes every so often to help them release juice but keep cooking it covered. After 3 hours I removed the cover (I never used pressure cooker locked cover) and let reduce to fairly thick consistency, stirring more frequently. Never let it burn! Food mill removes the seeds and tomato skin. 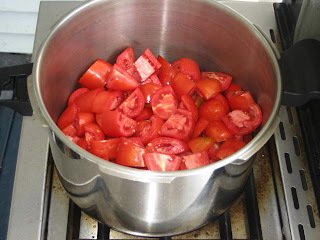 I started with 4 quarts (4L) of tomatoes that gave me 4 cups (1L) of thick sauce. Since it was 30 °C outside I have decided to make the sauce on my BBQ side burner so I won’t heat up the house. Unfortunately, the BBQ burner doesn’t have too much of a heat control plus if I run it low the wind can blow off the flame. Compromises. Also, towards the end of making the sauce, when the sauce thickens, it is very easy to burn. Because it is much more likely to burn in thin bottom pot I have decided to use my pressure cooker pot because it has very thick bottom. It all worked like a charm. 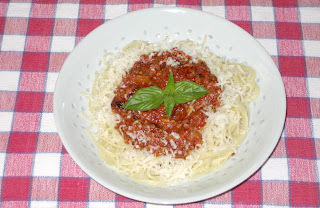 When done, you have a great basic tomato sauce to be used for many other sauces. My first sauce was simple spaghettini sauce where I sautéed onions, eggplants, celery, red pepper, garlic (lot of it), hot pepper flakes and oregano for 15 minutes, added the tomato sauce and simmered for 30 minutes on low. Done, no straining or mashing, I like some texture in this sauce. 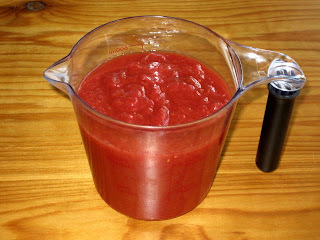 It looks like I might buy some Roma tomatoes at our farmer’s market to make some more sauce, it is that good!